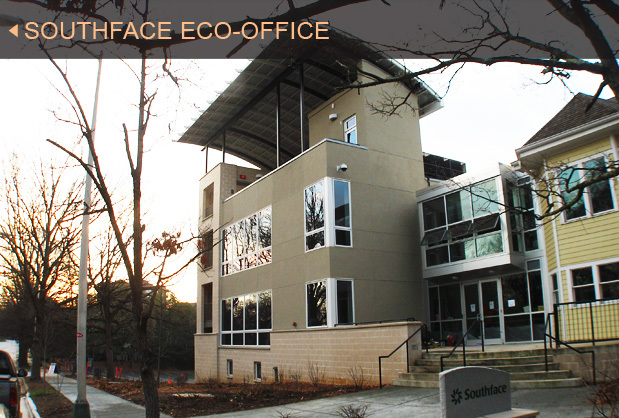 Green Building, Green Building Projects, Southface Eco-Office, Clivus Multrum Inc.
Southface is a non-profit organization founded in 1978 dedicated to bringing green building principles to the greater Atlanta area. Through their model home EarthCraft, Southface has encouraged thousands of home builders to go green. With their newly expanded headquarters at the Eco-Office they have expanded their work to the commercial green building market. The goal of the Eco-Office was to incorporate as many green products into their facility as possible to serve as a showcase for the local community. Considering the water shortages in Georgia caused by droughts in recent years water was a primary concern. Eliminating water for flushing toilets was a perfect example of water conservation so a Clivus Multrum composting toilet was included in the new show facility. The LEED Platinum facility has a commercial composting toilet system that serves the office area and can accommodate 40,000 uses per year. The Foam-flush toilets offer a familiar bathroom experience for users while using only six ounces of water per use. When compared to conventional 1.6-gallon toilets the Clivus systems could save more than 60,000 gallons of water.